Omg, this movie. 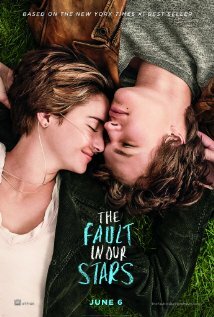 This movie made me cry so hard! I did know all about this story, because I read the book and I loved it too. I loved it so much and I was so scared that the movie would disappoint me. I loved the trailers, I could find my favorite scenes from the book in the trailers. They didn’t change a thing in the trailers. They did change one or two little things in the movie, but they were just small things. I didn’t feel it took anything away from the movie and its story. The actors were so well chosen. Shailene Woodley and Ansel Elgort are marvelous. I haven’t seen them so connected to their characters and they bring a whole other dimension to this movie. Nat Wolf was well cast and really cute as Isaac. And I was so pleased with Laura Dern and Sam Trammell! I wouldn’t have picked them in this movie. But it worked so well! I felt bad for them and I felt with them when something happened. It just made me more connected with the story. The cinematography was so good. They used a lot of different techniques in this movie, slower shots, out of focus and pulling into focus when it mattered. I like it when the cinematography really follows the story and makes the emotions, you have to feel, stronger. This entire movie is just from beginning to end a funny and sad story. It makes you cry and laugh. It makes you laugh while you’re crying. All the people in the cinema were crying with me, and it didn’t feel weird. It was a beautiful story, well written and well transcribed in a movie.